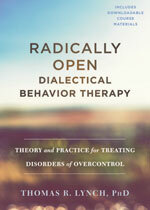 Radically Open Dialectical Behavior Therapy (RO DBT) is a new evidence based treatment targeting a spectrum of disorders characterized by excessive self control, often referred to as overcontrol (OC). It is supported by 20 years of clinical experience and translational research that parallels established guidelines for treatment development (e.g., UK Medical Council, 2008; Rounsville & Carroll, 2001; 2006). For clients: listen to this podcast in which Dr David Maynard interviews Dr Thomas Lynch and Erica Smith-Lynch to find out if RO DBT might be helpful for you. Thomas Lynch explains why we need a new treatment for people with too much self-control. Ellen Astrachan-Fletcher from the Eating Recovery Center talks about RO DBT for their clients with eating disorders. Join me tonight as I interview Kevin Kloosterman on Mormon Mental Health Facebook live tonight starting around 9:45-9:50 CST. We will be talking about a new evidence based treatment that is helpful for those dealing with chronic depression and anorexia. Feel free to share questions or comments here on this thread that we can address as we go. RO DBT significantly differs from other treatment approaches, most notably by linking the communicative functions of emotional expression to the formation of close social bonds and via skills targeting social-signaling and changing neurophysiological arousal. RO DBT treatment involves both individual treatment sessions and skills training classes, and centers around five OC themes: inhibited and disingenuous emotional expression; hyper-detailed focused and overly cautious behavior; rigid and rule-governed behavior; aloof and distant style of relating; and high social comparison and envy/bitterness. Receptivity and Openness to new experience and disconfirming feedback in order to learn. Flexible-control in order to adapt to changing environmental conditions. Radical Openness is the core philosophical principle and core skill in RO DBT. Radical Openness is a way of behaving, but it is also a state of mind informed by the central premise that emotional well-being involves the confluence of the above three features: openness, flexibility, and social connectedness. As a state of mind, Radical Openness involves actively seeking our personal unknown in order to learn from an ever-changing environment. Radical Openness also enhances relationships because it models humility and the willingness to learn from what the world has to offer. Ever since the publication of Charles Darwin’s seminal The Expression of the Emotions in Man and Animals (Darwin, 1872), a number of theorists and researchers have argued that our emotions evolved for the purpose of communication. Nevertheless, as science became increasingly sophisticated at investigating internal experience (such as cognition, physiology, attention, and neurobiology), treatment approaches increasingly tended to overlook this argument. RO DBT links neuroregulatory theory and the communicative functions of emotional expression to the formation of close social bonds, and introduces a unique thesis regarding the mechanism by which overcontrolled behavior leads to psychological distress. Robust research shows that context-inappropriate suppression of emotional expression or incongruent emotional expression (that is, a mismatch between outward expression and inner experience) will make it more likely for others to perceive one as untrustworthy or inauthentic (Boone & Buck, 2003; English & John, 2013; Kernis & Goldman, 2006), and that the consequences are a reduction in one’s social connectedness and exacerbation of one’s psychological distress (Mauss et al., 2011). In this way, OC biotemperament-based threat sensitivity, combined with overlearned tendencies to mask inner feelings, are hypothesized to engender social ostracism and loneliness, thus exacerbating psychological distress. Biotemperament: refers to genetic and biological precursors moderating emotional perception and regulation at both the sensory-receptor (pre-conscious) and central-cognitive (conscious) level of emotional processing (whereas, ‘trait’ refers to stable patterns of behavior moderated by both environmental factors—such as trauma—and biotemperament). It teaches clients context-appropriate emotional expression and the use of nonverbal social signaling strategies that have been shown to enhance social connectedness. It targets biotemperament-based OC deficits and excesses by teaching skills designed to activate areas of the brain associated with the social safety system, and it encourages clients to use these skills prior to engaging in social interactions. This approach enables an overcontrolled client to naturally relax the facial muscles and send nonverbal signals of friendliness, thereby facilitating reciprocal cooperative responses from others as well as fluid social interactions. It teaches therapists how to take advantage of mirror neurons and proprioceptive feedback in order to elicit activation of the social safety system in their overcontrolled clients by educating them about the deliberate employment of gestures, postures, and facial expressions that communicate relaxation, friendliness, and nondominance. This aspect of RO DBT underlies the emphasis on the importance of therapists’ own practice of Radical Openness (RO) and RO skills. You can read more about RO-DBT on the ABCT website: RO DBT Fact Sheet.